Does beth89 belong in this group? 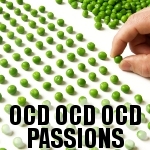 Love my OCD... I think Its not bad, but if I see a mismatched array of toy cars or sauce packets in a fast food place, I'm compelled to neatly arrange them. Does roxas488 belong in this group? Does deedee1937 belong in this group?